Capricorn September 2017 Horoscope predicts that the House of Career is very dominant this month. It is natural that your emphasis should be on professional growth. Domestic concerns will be in the background for the Capricorn zodiac sign. Your professional success will cheer up the family environment in September 2017. Capricorn, this is a transitional month with most of the planets moving to the Eastern sector of the horoscope towards your ascendant sign. Till the 20th of September 2017, you have to depend on others, and social skills are necessary to attain your goals. After that you are the king and you have the independence to do what you want. Your confidence level will be high and you can take strong decisions and actions in September 2017. Influence of Moon will inspire the Capricorn’s love mates to help them understand spirituality and foreign cultures. The astrology 2017 forecast shows that the professional development of the sea goats will be excellent in September 2017. You will get many chances to further your career. Family and friends will encourage the success of your business. You can expect promotions and increments in your job after the 11th of month September 2017. The September 2017 Capricorn monthly predictions forecast, compared to last month monetary situation is much better this month. You have the encouragement of the management and family members in improving your earnings. Friends and social contacts will provide necessary chances to boost your finances. Planetary aspects are not auspicious for large scale spending or for monetary investments for the Capricorn personality in September 2017. The Capricorn September 2017 love zodiac predicts that singles will find love in their working environment or in social gatherings through friend and acquaintances. There are many chances for forming romantic relationships, but they are more for fun and entertainment. Commitment will be absent in these romantic alliances in September 2017. Read more about the Capricorn man in love and Capricorn woman in love. Family environment will be pleasant for the Capricorn born in September 2017 because of the influence of Moon. Marital lives will be enjoyable and romantic with scope for pregnancy in September 2017. The September 2017 horoscope for the Capricorn personality forecasts that health will be fragile towards the end of the month due to stress and tension. It becomes necessary to slow down. Your well-being can be enhanced with a good exercise routine and by controlling your sexual urge. Read more about Capricorn fitness. Capricorn, you can kick all undesirable habits and cravings to improve your personality and charm. The month is suitable for programs involving weight reduction, detoxification of body and improving mental fitness. 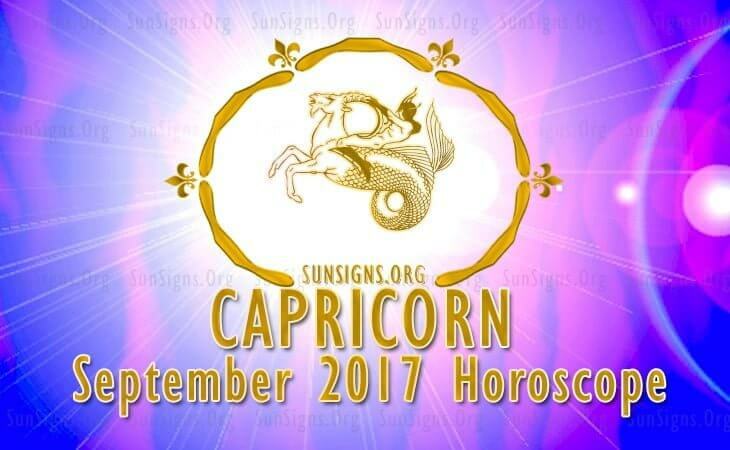 The September 2017 monthly horoscope for the Capricorn sun sign predicts a month of hectic career commitments and enjoyable relationships.